Laminate flooring is becoming more and more popular today in North America and all over the world, although it started as a European innovation. For households and offices which require a low maintenance flooring solution, laminate flooring has been known to be an effective choice for its attractiveness, durability, ease of installation, as well as for its reasonable price when compared to many other flooring options. However, despite the fact that laminate flooring is popular, there are a great many misconceptions and mysteries surrounding it in terms of how laminate flooring is made and how it differs from solid hardwood. This guide is meant to clear up these misconceptions and reveal some of these mysteries, as well as outline some of the major benefits of laminate flooring. Armed with this knowledge, it is hoped that eBayers can go forward and buy their choice of laminate flooring with confidence! One of the first mistakes people make is to confuse laminate flooring with solid hardwood flooring. The two should never be thought of as similar, despite the obvious visual similarities that makes quality laminate flooring such an attractive choice. 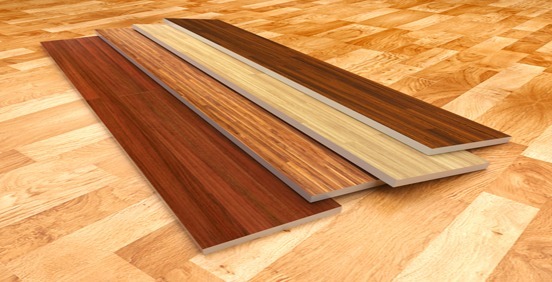 Laminate flooring is not comprised of any real hardwood species at all. In fact, the surface of a laminate floor is actually a highly rendered photograph, often of a hardwood species. This top layer, or decorative layer, is sealed by a resin-based coating which gives the laminate flooring board its resistance to many forms of abrasion. The two remaining layers of laminate flooring are the core layer and the backing layer. The core layer is most often made of high-density or medium density fiber board, which serves as a means to absorb the stress of footfalls and other forms of impact. The backing layer, otherwise known as the stabilizing layer, is the layer of the laminate flooring which binds all of the others together. 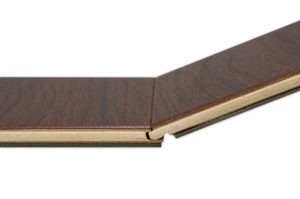 All in all, each layer of the laminate flooring board is designed for maximum structural strength, although not all laminate flooring lines are created equal. For a more detailed breakdown of just how much stress each type of laminate flooring is meant for, you need to find out what the AC rating of the laminate flooring is. What is an AC rating? AC3 is suitable for high traffic residential use and low traffic commercial use. AC4 can be installed in higher traffic commercial areas such as boutiques, busier offices, and restaurants. All reputable manufacturers of laminate flooring adhere to these standards which are outlined by the industry for the benefit of consumers. It is important for consumers to note the AC rating on the laminate flooring they are considering, particularly with the idea of foot traffic, moisture, and other stresses that the laminate flooring will need to endure firmly in mind. One of the key characteristics of laminate flooring, and one that is kept in mind when it is manufactured, is how easy it is to install when compared to other types of flooring. 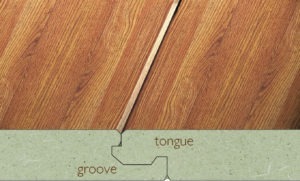 Of the many designs, some of the more efficient and mess-free laminate flooring lines are the "glueless" variety. 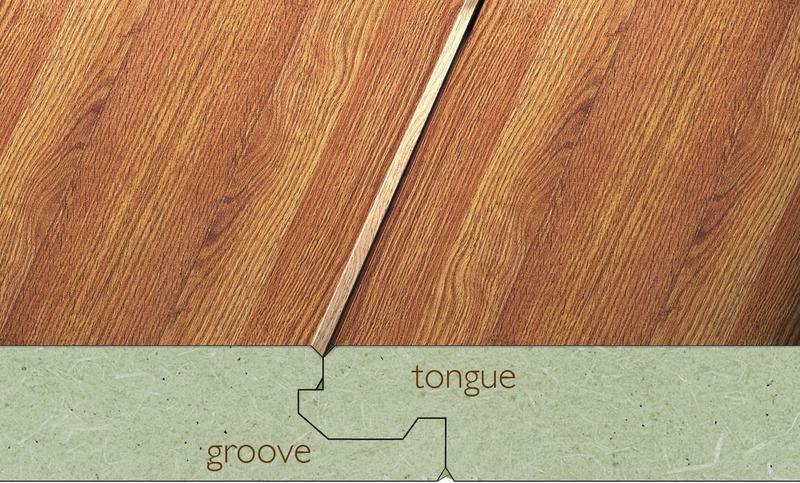 With this variety, the laminate flooring is generally fitted together by means of what is called a "tongue and groove" design, with interlocking elements that slide into place and are made secure as each row is laid down. Unlike hardwood, no nails are required. Some types of laminate feature more sophisticated locking systems, designed to be put down and taken up again where necessary. With some fairly limited skills in carpentry, laminate flooring can be installed by do-it-yourselfers in most cases. Choosing to install laminate flooring commonly cuts down on expenses, as it is rarely necessary to hire an installer, although many homeowners do for the sake of convenience. For contractors, offering the option of laminate flooring to clients is often a time-saving option, as laminate flooring is more quickly installed than hardwood flooring, allowing them to take on more contracts. Generally speaking, laminate flooring is a low maintenance option that is easily installed, but there are a few things to keep in mind before purchasing laminate flooring as well as once they've been installed. Here are a few pointers when looking to maintain a laminate floor. Posted in Uncategorized and tagged home decoration, laminate, laminate floor duarte, laminate floor glendale, laminate floor los angeles, laminate flooring. We provide the highest quality of products and services and installation because we understand that the home is a place of comfort, a place to be proud of, somewhere dreams are realized, where families grow, and wonderful memories are made.